Malaria diagnostic tests are very difficult to perform in areas that lack laboratory facilities. The common lab tests for malaria are microscopy and Nucleic acid amplification tests. Both these tests require well-equipped laboratories. In areas where these are not available, malaria test depends on recognising the symptoms of patients. Clinical diagnosis of malaria is the only option left for them, though this is often faulty. Such a misdiagnosis leads to prescription of unnecessary medications that are not only expensive but also harmful. Moreover, drug resistance developed by malaria viruses throughout the world demand improved accuracy of diagnosis for effective treatment. It is one of the popular methods of detecting malaria but is available only in relatively better equipped medical facilities. It can confirm the clinical diagnosis of malaria and give information about the kind of virus present in the blood. This facilitates in determining the most appropriate drug for treatment. Although, it is possible only in better-equipped clinics or hospitals, microscopy is not expensive to afford for the patient. There are various factors that enable accurate diagnosis including quality of equipments and expertise of the microscopist. Many NAAT (nucleic acid amplification technologies) Tests are used now-a-days to diagnose parasitic DNA present in the bloodstream. To be successful, these malaria diagnostic tests involve a lot of training of the concerned professionals apart from incurring of expense for reagents and equipments. Even after detection of parasitic DNA in the blood, it is very difficult to determine whether the malaria infection is active or recently cleared. Because of the challenging situations faced in diagnostic tests for malaria, especially in areas where advanced medical equipments are not available, other solutions have been preferred. These tests enable malaria diagnosis in areas where more specialised services like microscopy are not available or feasible. It takes only 10 – 15 minutes and with little training, anyone can learn to perform tests and analyse results without a laboratory. Venous blood is extracted from the patient for the tests. RDTs for malaria are based on detection of parasitic proteins in the blood. The most common of these proteins, also called antigens, are Plasmodium spp. lactose dehydrogenase (pLDH) and P. Falciparum histidine-rich Protein-2(pfHRP2). 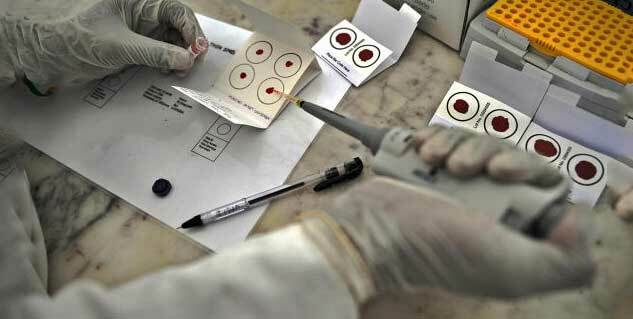 Some types of malaria parasite tests involve testing patients to ensure clearing of parasites after treatment. RDTs for pfHRP2 cannot be used with this intention because pfHRP2 antigens stay in the blood long after clearing of parasites. RDTs that are used for detecting pLDH are suitable for this type of monitoring of malaria treatment.